As more of my clients start approaching retirement age, I am getting many more questions about social security. Below are the answers to 5 of those questions. 1) How much is the social security tax? Social security is a shared tax with the employee paying 6.2%, and the employer paying 6.2%. The total tax of 12.4% of wages (up to a maximum of taxable earnings) are contributed for employees, while the net earnings of self-employed individuals are also subject to the 12.4% tax. The 2017 maximum taxable earnings was $127,200 with $7,886 being the maximum amount of tax that an individual paid. Every year the maximum taxable earnings is indexed for inflation. For 2018 the maximum taxable earnings increased to $128,400 with $7,961 being the maximum amount of tax that an individual will pay and a combined employee/employer tax of $15,922. The social security administrations keeps track of the amounts paid in for each individual. The earliest a person can begin to receive their benefits is at age 62. It's important, however, to note that the benefits will be reduced if they are taken immediately. A retiree will only receive a portion of the total benefit they would have been entitled to had they waited to reach "full retirement age" (See below). When you were born determines your full retirement age. Up until 1938 the full retirement age was 65, but it has been increasing ever since with it reaching 67 for people born in 1960 and later (See below). Figure 2: "Full Retirement Age" by year of birth (Source: https://www.ssa.gov/planners/retire/retirechart.html). Should I retire early, at normal age or late? 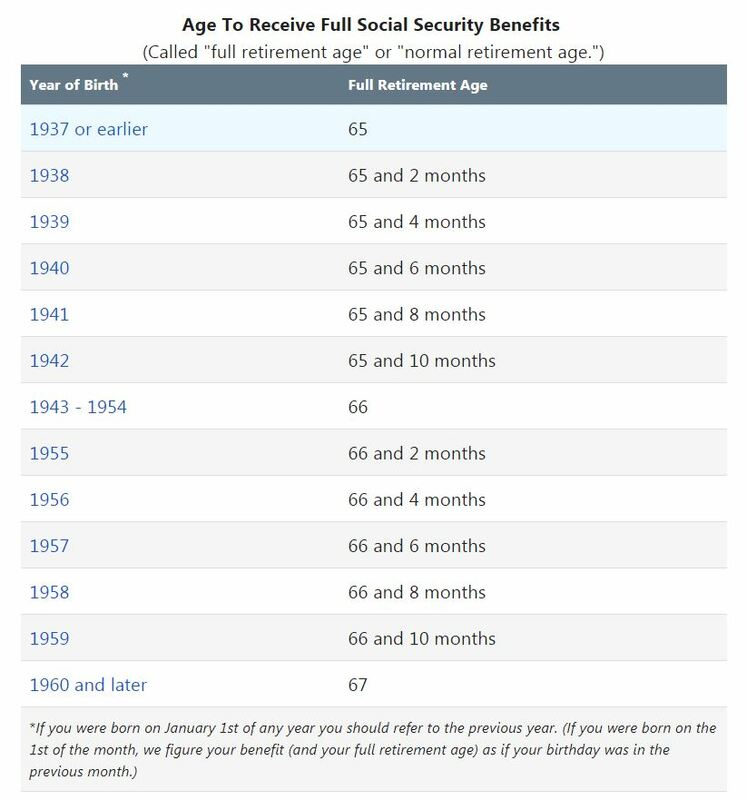 If you were born between 1943 and 1954, your retirement age would be 66 years old. Let’s say you’re your normal retirement benefit at age 66 calculated to be $2,850 a month. Your monthly benefit at an early retirement age of 64 (24 months early) calculates to be $2,450, and the monthly benefit at a late retirement age of 70 calculates (48 months late) to be $3,200. If you take early retirement benefits, there would be $58,800 of extra benefits taken before normal retirement age (24 months times $2,450/monthly benefit = $58,800). To calculate how long it would take you to recoup this extra benefit if you retired at the normal retirement age of 66 (the breakeven point) we use the difference in benefits of $400 ($2,850 - $2,450) and divide it into the $58,800 of extra benefits. So it would take 147 months ($58,800/$400) or 12 years and 3 months to breakeven. You would be 78 years and 3 months old before the normal retirement benefit would recoup the extra benefits from early retirement. If you take late retirement benefits, there would be $176,400 of extra benefits after early retirement age (6 years after early retirement age * 12 months/year * $2,450/monthly benefit). There is a $750 difference between early and late benefit amounts, so the break-even point would be 19 years and 7 months ($176,400/$750 = 235.2 months). So you would be 89 years and 7 months old before you break even. Under each of these scenarios it seems that taking early retirement may be a better option. However if you work while taking early retirement your benefits can be reduced. This could negate any benefit. There is an income limit of $17,040 in 2018. This means that benefits are reduced by $1 for every $2 you earn over the limit. Once you reach full retirement age, there is no limit on the amount of money you may earn and still receive your full Social Security retirement benefit. Because of this, most people work and wait until full retirement age to start taking benefits. Yes, to an extent. Benefits began being taxed in 1984. Individuals who have a combined income (adjusted gross income plus any nontaxable interest you received plus half of your Social Security benefits) of $25,000 to $34,000 must pay income tax on as much as 50% of their Social Security benefits ($32,000 to $44,000 for married couples filing jointly), and individuals who have a combined income of $34,000 or more must pay income tax on as much as 85% of their benefits ($44,000 or more for married couples filing jointly). What are the survivor benefits? Upon the death of a spouse, you are eligible for a Social Security survivor benefit as long as you have been married for at least nine months. (This length of marriage requirement is waived if you are caring for a child of the deceased spouse who is under the age of 16.) You can collect a monthly survivor benefit as early as age 60, but at this age you will only receive about 70% of the amount you could get if you wait until your full retirement age. If you are disabled, you can collect a Social Security survivor’s benefit as early as age 50. If you are an ex-spouse but were married at least ten years, you are eligible for the spousal survivor benefit - even if your ex-spouse remarried. Even if your spouse has never worked under Social Security, they may be able to receive benefits if they are at least 62 years of age and you are receiving or eligible for retirement or disability benefits. They would normally receive 50% of the your benefit amount. There have been some recent changes for spouse benefits. For people who turned 62 on or before January 1, 2016, they still can claim spousal benefits once they reach their “full” retirement age and they also can earn “delayed-retirement credits” on their own benefits. In other words, if you already are receiving Social Security retirement or disability payments, your spouse can start collecting benefits based on your income history while the benefits based on his/her own income history will continue to grow by 8% for each year that (s)he delays starting those benefits until (s)he turns 70. Because of the rule change, people who turned 62 after January 1, 2016, and who file for spousal benefits at full retirement age will be “deemed” to also have filed for their own retirement benefits, which means that they will not continue to earn those valuable delayed-retirement credits. In other words, these people will not receive two benefits. Instead, their monthly check will be equal to the larger of the two types, with the smaller one essentially lost. I hope this helps answer some questions about social security. The Social Security Administration has much useful information and calculators on their website at www.ssa.gov.